In my opinion, one of the most vital accessories that should be in every room during the winter is a humidifier! It has helped my son (and family!) breathe, have less dry skin and sleep better at night throughout his whole life! With my daughter on the way, I wanted to get a quality humidifier to put in her new room. I found just the perfect one with the Vicks Starry Night Cool Moisture Humidifier! If you don't believe my personal testimony on humidifiers, then listen to the AAP! The American Academy of Pediatrics recommends using a cool mist humidifier throughout the winter months to help relieve congestion and coughs for youngsters. Now, thanks to Vicks and new technology, tots can fall fast asleep beneath a vast sky filled with glowing stars – and they’re easier to count than sheep! The Vicks Starry Night Humidifier releases cool moisture into the air, providing temporary relief from cold and cough symptoms. The humidifier’s built-in, independently controlled projector can be turned on and off, making it ideal for all ages while also saving energy – just flip the switch off once their tired eyes have closed. 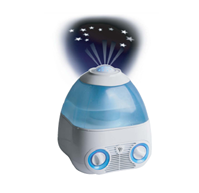 The Vicks Starry Night cool mist humidifier features a projector that comforts your child while creating a calm night perfect for children of all ages. Like I said, I am a huge fan of and always recommend humidifiers to all parents during the winter months (especially during the winter!)! I love our new Vicks Starry Night Humidifier because it not only fits perfectly in our star themed nursery, but it is perfect for keeping my little girl's skin from getting too dry and will help her with any colds she may get in the early years! The stars are so fun and just add such a fun aspect to this humidifier! I haven't seen that before on a humidifier and I love how soothing it can be. It is also great as a night light during late night feedings! It is easy to turn on and off independently of the humidifier! I also like that it is a cool moisture humidifier so I never have to worry about my children getting burned! You also have the option of adding a scent pad for a comforting non-medicated scent. It is easy to fill and lasts 18-24 hours which is not super long, but that means it only needs to be filled about every two days if you are running it only at naps and bedtime! Buy It: You can purchase the Vicks Starry Night Cool Moisture Humidifier for $54.99 from the Vicks online store. Win It: Vicks is generously offering (1) Vicks Starry Night Cool Moisture Humidifier to a lucky winner! WOuld love to win this humidifier!